New Hope Solebury Cares - Times Publishing Newspapers, Inc.
Local non-profit, New Hope Solebury Cares, is working together to support a safe, healthy, and addiction free New Hope and Solebury. Their vision is a future where all individuals and families in New Hope and Solebury thrive and reach their fullest potential. New Hope Solebury Cares hopes to achieve this by implementing community collaboration, education, advocacy, and youth leadership programs in the community. *Volunteer – The most precious gift you can give is of your time and talents. NHSC will work closely with you to identify a role that is a good fit for you. *Attend NHSC Meetings – Each month NHSC offers a free evening educational seminar to our community. Members of the community are welcome to stay after the seminar to join in on the discussion of NHSC work. * One ticket the NHSC annual awards dinner. * One ticket to the NHSC annual awards dinner. * Two tickets to the NHSC annual awards dinner. Through your partnership and support the New Hope-Solebury community can Thrive Together! 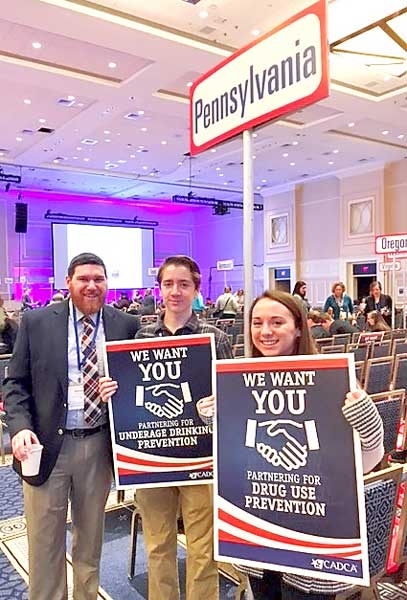 PHOTO CAP: From left, Zachary Mahon NHSC Director, Michael Wilson NHSC Student, and Becca Wilson NHSC Youth Sector Leader, representing NHSC at CADCA’s National Leadership Forum.